Secratary for State Chris Grayling has agreed to meet and discuss with the Brighton Mainline 2 consortium. A group of investors have agreed to provide funding for the project which will link Brighton with Canary Wharf. Grayling has acknowledged the viability study report submitted in 2015 had been on the table for far too long and promised that he would publish the government findings very soon. The project involves reinstating the former double-track main line rail links into both Tunbridge Wells (West) and Lewes via Oxted. 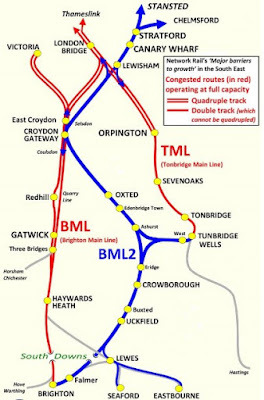 Additionally, BML2 includes constructing Ashcombe tunnel (1.5 miles / 2.4km) beneath the South Downs to provide fast, direct access into the City of Brighton and Hove via Falmer. Thus, the all-important second route to the Sussex Coast is achieved and delivers all the much-needed additional capacity which is required. Altogether, Eastbourne, Seaford, Newhaven, Lewes, Brighton, Bexhill, Hastings, etc, would equally gain an additional, direct fast main line to London and beyond. Consequently, this would see greater additional capacity between the Sussex Coast and the capital. In recent months particular interest in BML2 has been shown within Canary Wharf. This is because subsequent enhancements to the original concept have substantially increased its potential. Precise details are expected to be disclosed in the coming weeks, but the plan would provide superior connections in the Stratford area and bring many benefits.